The iDLMax multimodal, rugged mobile computer offers a complete set of features for virtually any identity management challenge. With on-board contact card, contactless card, barcode, optical fingerprint, and magnetic swipe readers combined with a digital camera, GPS, and comprehensive wireless communications, the iDLMax is truly unique! The iDLMax integrates enhanced features for the widest range of identity management applications. Additional card reading capabilities are provided by the combined contactless & smart card reader which is FIPS-201 compliant and has iClass® capabilities with optional magnetic swipe allowing the operator to screen credentials, including passports, e-passports, Transportation Worker's Identification Credentials (TWIC), Common Access Cards (CAC), First Responder Authentication Cards (FRAC), Personal Identity Verification (PIV), drivers license and other documents. The latest digital camera technology offers fast acquisition of FIPS-201 compliant facial images even under low-light levels. This powerful set of personal identity validation features are complemented by GSM/GPRS/EDGE, 802.11b/g WiFi, and Bluetooth wireless communications capabilities. 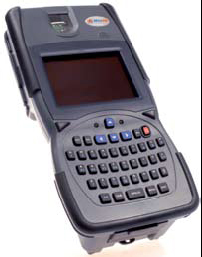 Running Microsoft® Windows CE .NET 5.0, the iDLMax offers an open, flexible platform. It is supplied with a comprehensive Software Development Kit to enable fast and easy application development.